We are presented today with some beautiful readings - the first reading and the gospel which are so well tied together. In the first reading from the book of Samuel we are presented with the King David who is now resting in his palace. He's kind of resting with his feet up. He's accomplished much in his reign as king and so now he has decided that he has got everything that he wants or perhaps achieved - everything he could have dreamed of. It's time to give back to God. And God, speaking back to David through the prophet Samuel says this, "David, you need not build me a house. In fact, David, what I will do is build you a house." And what our Lord is trying to tell us through this prophecy of Samuel is something very beautiful but is perhaps lost on us. You see, in this Advent season, what we're trying to do is trying to open our hearts and minds to accept Christ and to make ourselves a gift to Him. But really, all of this preparation is conducted so that Christ can make Himself gift to us. So it's somewhat of a paradox. We prepare our hearts to give to God but we are recipients of an even greater gift, more than we could ever imagine. The more we give ourselves over to God, the more he gives himself back to us, and he is never outdone in generosity. And this house that he promises to build upon David's foundation, his family, is no one short of our Lord and Savior, the second person of the Blessed Trinity, who is of course conceived in the womb of the Blessed Virgin Mary as depicted in the gospel of Saint Luke which we have just read a few moments ago. If we are truly pro-life people, as we are, we should not only celebrate Christmas with great jubilation but we should also celebrate the conception of Christ in the womb of the Blessed Virgin Mary which we do every year on March 25, the Annunciation with great joy as well. For, if we believe that life begins at conception, we should not only celebrate the birthday, but we should also celebrate the date of conception. 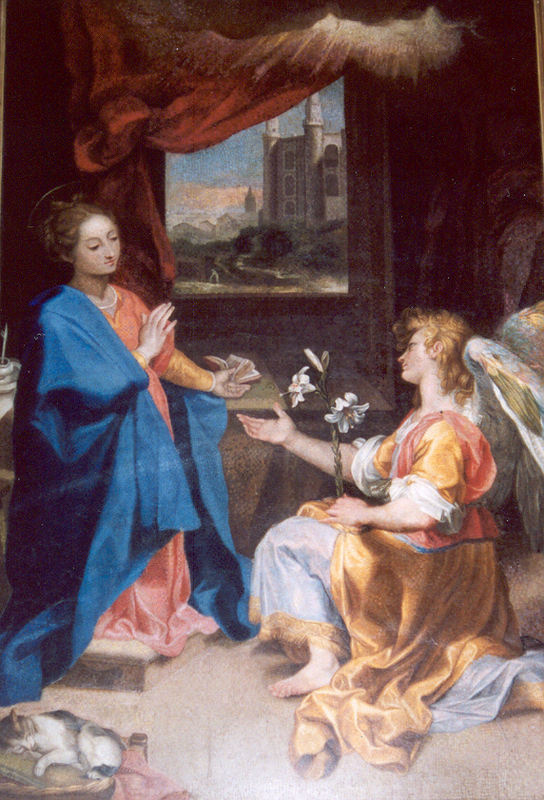 So in the gospel today, the Blessed Virgin Mary is startled by the message of an angel, the angel Gabriel. She is not startled because she fears or lacks trust in God's plan but because as the tradition of the fathers of the Church have taught, and this has been a constantly held tradition in the Church over the centuries, the reason Mary was somewhat troubled by the message of the angel was that it was believed that she had already made a private vow of virginity to God - even prior to the Annunciation. In other words, when the angel Gabriel announces to her that she will be a mother (and the Mother of God at that!) she is troubled by the message because of her prior private vow to God. The angel's message does not coincide with the vow she has already made to God. Unfortunately you will hear people say that this whole story of salvation starts with a crisis pregnancy because Mary was not a married woman. That's not true. Mary was a married woman, she was betrothed to Joseph. You see, westerners celebrate marriage in one fell swoop where you have the wedding, then the reception, they you go off to the honeymoon and its sort of one whole event. But, in the Jewish system it was a little bit different. The man and woman would exchange consent, called betrothal. That was already a marriage. Then, the husband would go away for a while, maybe six to nine months to a year, to prepare a house, and a home, and a life for his new bride and then he would come back and take her for his wife. If there is anything to be said about a crisis pregnancy it is only that Mary conceived without a man's love. That was certainly unique by any stretch of the imagination. But, it also means that Mary conceived without Joseph because Mary and Joseph weren't living together yet. Even though they were married they were not living together yet and that is why the angel Gabriel has to tell Joseph in a dream not to be afraid to take our Lady as his wife. And so Mary, having taken this private vow of virginity reminds us that she foregoes her natural right to marital intimacy as to bear forth Christ in the world. This is the decision that everyone called to the charism of celibacy must make. They forego their natural right to marital intimacy so as to bear spiritual children in the world. That's what priests do, that's what religious do. They do not have natural children, but spiritual children. And they forego their right to marital intimacy to bear fruit - spiritual children in the world. And so this whole notion of the angel Gabriel's message regarding the phrase, "Nothing is impossible with God" was certainly true in our Lady's life. When Gabriel says to Mary, "Nothing will be impossible for God," Mary could have easily said, "You've got that right! My goodness, my cousin, who was considered barren, is now six months pregnant and I'm going to conceive without a man. Even though I have already made a private vow of virginity, God has other plans for me," Mary would say. The conception of Christ and the nine months leading up to the birth of our Lord in the womb of the Blessed Virgin Mary ushers in two very important themes for us to consider. First, it ushers in the notion of mercy. We call Mary the Mother of Mercy because her "yes," her fiat sets into motion the process by which Christ is conceived and born; how he lives, conducts His public ministry, then eventually suffers and dies for us. Without Mary's "yes," we have no idea how Christ could have been born into the world. He could not have been born into our human condition had he not been born of woman. And so, Mary's "yes" is a great indication of the heart of mercy that she has for her children, her spiritual children - you and me. Second, the Incarnation ushers in a new era friendship between God and man. Jesus is not our friend as if He were our buddy, or our pal, or the guy we play poker with on Thursday nights. The friendship which God extends to us through our Lord and our Lady is rather unique because remember what our Lord says about friendship with Him. He says, "You are my friends if you do what I command you." I don't know about you but I don't have friends like that. I don't say to Father Vander Woude, "Father, you are my friend if you do what I command you." He would laugh at me. You can imagine a husband and a wife saying to each other, "you are my friend if you do what I command you," and even more improbable claim. And so the friendship that Christ invites us into by virtue of His Incarnation is a communion with God, body and soul, to will the good for the other. That is the nature of true friendship; to will the good for the other. It's based on true charity. So, as much as God invites us into a friendship, a communion with him, an intimacy with him, unknown to man prior to the Incarnation, we also are faced with the reality that this friendship is a friendship in a qualified sense. It is not a friendship as if we are peers with God. Rather, he is still our Lord, our Master, who will come back to judge us but invites us into and intimacy with him which, of course Mary ushers in by her "yes" at the Annunciation. And so, perhaps the enduring message of the Annunciation for you and for me is that we need to answer the same question that is posed to Mary by the angel Gabriel. Paraphrased in our time and for our context, "Will you open your heart to Christ? Will you accept Him so as to bear forth Christ in the world?" It's a question that our Lord asks of us every day. Sometimes we are not even aware that the question is being asked, but that is the question. The same question at the Annunciation, "Will you accept Christ in your life so as to bear Him forth in the world? This is the vocation of holiness. This is the vocation of every Catholic, every Christian to bear forth Christ in the world. Let us strive to imitate the Blessed Virgin Mary's state of recollection in order to be attentive to the call of God, his invitation he gives us in mercy and in friendship in order to bear forth Christ in the world.